In the interest of making baseball a safe and enjoyable experience for all and to align ourselves with neighboring communities, effective January 1st 2015, Cooper City Optimist Baseball has moved to adopt the bat rules implemented by the USSSA back in 2012. Compliance with these rules is mandatory for all players and all teams and applies to all levels of play offered by Cooper City Optimist Baseball (In-House, All-Stars and Travel). Must say "Tee Ball" or "Official Baseball"
All above bats (Big Barrel and Small Barrel) must be manufactured by an approved USSSA Bat Licensee. 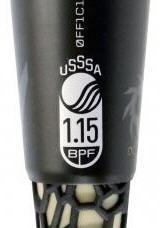 * Qualified BBCOR Bat – A Big Barrel bat that is made by a USSSA approved bat license, has a BBCOR mark permanently attached to the bat that is recognized by NHSF as a legal bat for NHSF sanctioned play and has no more than a minimum minus 3 ounces difference from the length of the bat and is a minimum bat length of 29 inches. For a complete listing of the USSSA bat rules, the new USSSA Mark and for approved USSSA Bat Licensed manufacturers, please see the USSSA baseball website at www.usssabaseball.org. * Baseball bats that are designed or marketed as Coach Pitch and/or not for use with regulation baseballs are not legal in activities that use regulation baseballs. This is for all ages and all divisions of Tee Ball, Coach Pitch, and Kid Pitch, but not limited to these. The bat rule adopted is for the safety of players. It is a coach’s responsibility to ensure that the bats being used by their players conform to the bat rule and as such, offenses are considered a serious breach of rules. First Offense – If the umpire discovers that the bat does not conform to Cooper City Optimist Baseball Rules and prior to a ball being put into play, the umpire will remove the bat from play and the player must then utilize a legal bat. It shall not be grounds for declaring the batter out and/or ejection from the game. If the umpire discovers that a bat has been used to put a ball in play and before the next legal pitch, the defensive team will have the choice of the result of play or the batter being called out and all runners returning to the base occupied before the pitch. Second Offense – If a team is found in violation of this rule a second time (coming to the plate with an illegal bat – whether or not a ball is put into play), then the manager (or acting manager) will be ejected in addition to the First Offense penalty.